1. 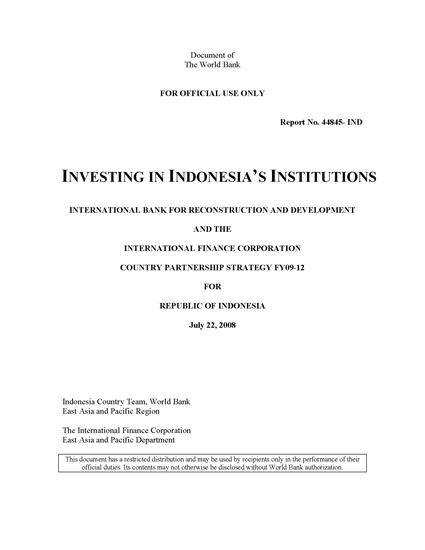 This Country Partnership Strategy (CPS) for FY2009-12 marks Indonesia’s re-emergence as a confident middle-income country (MIC) that has graduated from IDA, and is enjoying a rising regional and global standing. With a Government that is demanding dependable and timely support for its own development priorities and its poverty-reduction agenda, this CPS positions the World Bank Group (WBG) to respond better to these challenges, thereby ensuring the WBG’s continued relevance in the new Indonesia. the center of the Government’s program and relevant institutions have been strengthened. and encourage others to replicate them. continued robust macroeconomic performance, financial stability and momentum on key reforms. in the event of an acceleration of reform in private infrastructure provision. increasingly, will have this type of work led by, and based within, Indonesian institutions. Southeast Asia’s most successful economies.